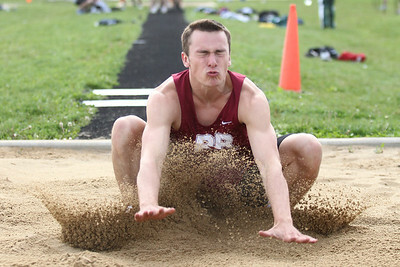 Mike Greene - mgreene@shawmedia.com Prairie Ridge's Nick Nissen lands while competing in the long jump at the FVC Boys Track Meet Friday, May 11, 2012 in Woodstock. Mike Greene - mgreene@shawmedia.com Crystal Lake South's Zane Boettcher runs anchor for in the 4x100 meter relay at the FVC Boys Track Meet Friday, May 11, 2012 in Woodstock. 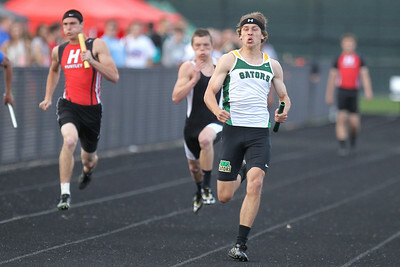 Crystal Lake South won the event and broke the conference record in the process. 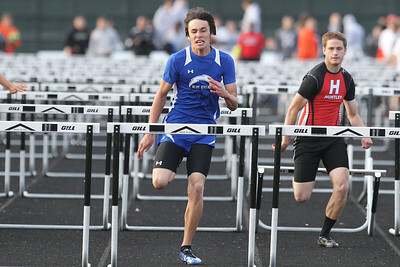 Mike Greene - mgreene@shawmedia.com Woodstock's Tyler Parsons eyes the last hurdle while competing in the 110 meter high hurdles finals at the FVC Boys Track Meet Friday, May 11, 2012 in Woodstock. Parsons took first place in the event. 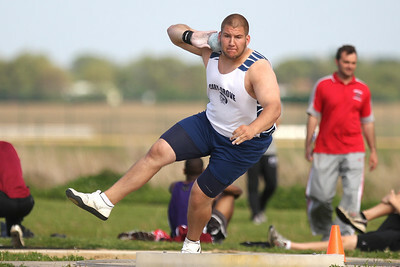 Mike Greene - mgreene@shawmedia.com Cary-Grove's Josh Freeman spins before throwing in the shot put at the FVC Boys Track Meet Friday, May 11, 2012 in Woodstock. Freeman won the event and set a conference record. 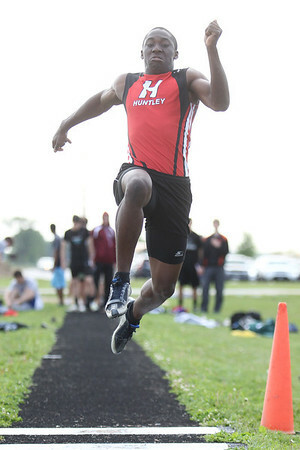 Mike Greene - mgreene@shawmedia.com Huntley's C J Ayemoba takes off while competing in the long jump event at the FVC Boys Track Meet Friday, May 11, 2012 in Woodstock. Ayemoba won the event. 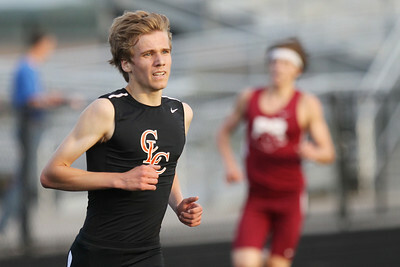 Mike Greene - mgreene@shawmedia.com Crystal Lake Central's Alex Baker runs ahead of Prairie Ridge's Mitch Wilkins while competing in the 3200 meter run finals at the FVC Boys Track Meet Friday, May 11, 2012 in Woodstock. Mike Greene - mgreene@shawmedia.com Jacob's William Hennessy runs the final leg of the 4x800 meter relay at the FVC Boys Track Meet Friday, May 11, 2012 in Woodstock. Jacobs won the event and set a conference record with a time of 7:54.91. 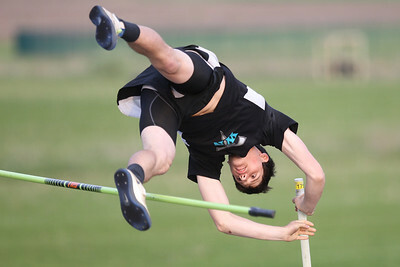 Mike Greene - mgreene@shawmedia.com Woodstock North's Jon Walsh watches the fall while attempting a jump at 15''03'' in the pole vault event at the FVC Boys Track Meet Friday, May 11, 2012 in Woodstock. Walsh took second place in the event. 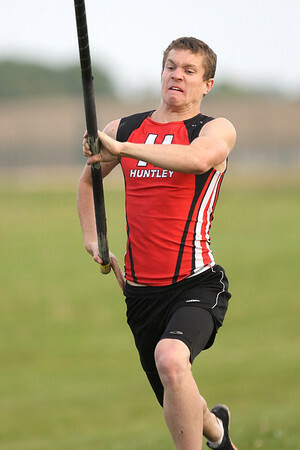 Mike Greene - mgreene@shawmedia.com Huntley's Ryan Sheehan takes his approach while competing in the pole vault event at the FVC Boys Track Meet Friday, May 11, 2012 in Woodstock. Sheehan tied for third place in the event. 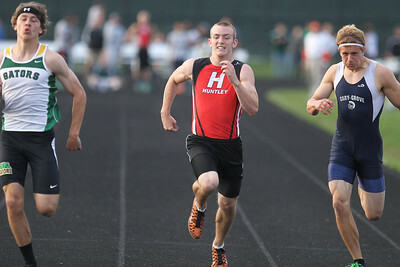 Mike Greene - mgreene@shawmedia.com Huntley's James Davis (center) and Cary-Grove's Tommy Rohn (right) try to catch up to Crystal Lake South's Zane Boettcher (left) while competing in the100 meter dash finals at the FVC Boys Track Meet Friday, May 11, 2012 in Woodstock. Boettcher took first place in the event. 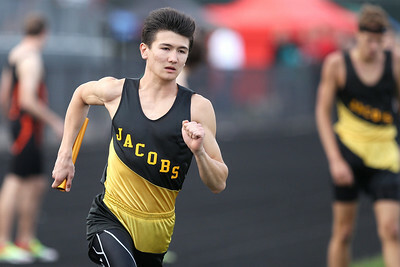 Jacob's William Hennessy runs the final leg of the 4x800 meter relay at the FVC Boys Track Meet Friday, May 11, 2012 in Woodstock. Jacobs won the event and set a conference record with a time of 7:54.91.